THE GREAT PYRAMID. Two Essays plus illustrations, one from The Reminder and the other from J.F. Rowney Press. 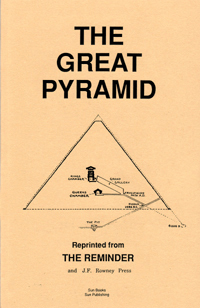 Selections include: The Pyramid's Location and Constructional Features, Some of the Pyramid's Scientific Features, other Features of the Great Pyramid, Complete History of Mankind Represented in the Pyramid, The Shortening of Time, The Symbolism of the Passages and Chambers, Etc. 40 pgs. 5x8. Paperback. ISBN: 0-89540-175-4. $3.00.